﻿ 3mensio Medical Imaging B.V.
3mensio is a product line of Pie Medical Imaging’s portfolio. 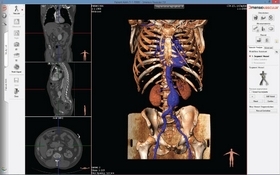 3mensio offers software for pre-operative sizing and planning. The 3mensio Workstation contains two modules: Structural Heart and Vascular. 3mensio Structural Heart contains dedicated workflows to assess structures in the heart in order to plan different procedures. 3mensio Vascular is dedicated to sizing and planning of EVAR, TEVAR and FEVAR procedures in a quick, easy and reliable way. 3mensio is used worldwide by vascular surgeons, (interventional) cardiologists and cardiac surgeons. Clinical representatives of device vendors are using 3mensio Workstation in the communication with their customers. Device vendors also use 3mensio Workstation in the development of new medical devices. Founded in 2003, 3mensio Medical Imaging originally developed advanced imaging software for radiology, based in 3D image reconstruction and analysis of standard CTA images. In 2011, 3mensio Medical Imaging was acquired by the Esaote group. Since then, Pie Medical Imaging is the legal manufacturer of the 3mensio product line. 3mensio has a dynamic team of excellent software developers and fosters close relationships with key opinion leaders. This enables them to bring strong added value to surgical and interventional departments. Robust business partnerships with device manufacturers have helped 3mensio become a leading company in pre-operative planning and sizing software. For trials, brochures and detailed description of the software see the Pie Medical Imaging website. Prepare endovascular interventions quickly, easily and reliably with 3mensio Vascular. Easily determine the appropriate landing zone for treatment of abdominal aneurysms (EVAR), thoracic aneurysms (TEVAR) or placement of fenestrated stents (FEVAR). All relevant measurements (e.g. diameter, clock position, volume and length) can be obtained using automatically detected centerlines or 3D double oblique views. Integrated manufacturer stent order sheets generate PDF files, so specific stents can be easily ordered via e-mail. A software tester. read more here. English speaking applicants: verbal proficiency in dutch is a requirement. The product management and sales for 3mensio products is handled by Pie Medical Imaging. If you are interested in joining that team, check out Careers at Pie Medical Imaging. 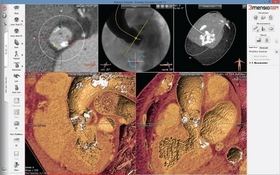 3mensio software is marketed and supported by Pie Medical Imaging.